How are you feeling lately? Would you say that you feel pretty good, but…you are tired in the early afternoon or even upon awakening? Maybe you feel pretty good, but…you’re feeling overwhelmed day to day and you can’t explain why. You’ve been getting more colds lately, you’re a little constipated, you aren’t sleeping so well and you’re gaining weight around your middle. You find yourself snapping at your spouse, kids and co-workers. Adrenal stress has become an everyday part of our fast paced lifestyle. Our bodies were designed to be physically active and thus be able to regulate itself and the hormone levels such as adrenaline that are released as a natural part of our “fight or flight” response. But, in today’s society, many of us are faced with a great deal of stress (an overwhelming amount of stress) that has no physical release. You see, despite the date on the calendar, our brains still operate at a primitive level, more like in the days of cavemen and dinosaurs. Our “Fight or Flight” response is meant to save our lives. By increasing adrenaline release, increasing our heart rate, increasing blood supply to our largest muscle groups, and improving our alertness, we can either fight off a saber toothed tiger or run from it. Adrenaline decreases digestion…because, it would be pretty inconvenient to have to use the bathroom while fighting off or running from a man-eating saber toothed tiger, right? This is a normal and healthy, a life-saving physiologic response to stress. The only problem is, in this day and age, we aren’t cave people fighting for our lives on a daily basis. Those physiologic responses create all kinds of problems for us as we are trying to sit quietly at our computers and work at our jobs. Our brains can’t distinguish between life threatening emergency situations and work stress or traffic jam stress or “there aren’t enough hours in the day” stress. Once the adrenaline is triggered and released, it’s “game on” for the rest of your body. Sitting in your car or sitting at your desk, you have no use for increased heart rate, slower digestion and increased blood supply to your muscles. Without a physical release for this response, we become a bundle of nervous energy. In some ways, we feel great. We are able to accomplish more in a short period of time, think faster and respond to others quickly and decisively. Unfortunately, we cannot operate this way for long. Soon our adrenals become depleted and the down side of this response kicks in. During a period of adrenaline release, cortisol is also released, which converts protein to energy, and stored sugar is also released. Glycogen gives our bodies instant fuel needed to respond to external threats with physical force. But, if that spike in blood sugar isn’t used for physical activity (like running a 5k), it triggers insulin to be released. Blood sugar can drop below optimum leaving you feeling tired, drained and unfocused. But the cycle doesn’t stop there! You are still at work and your boss has just e-mailed you pushing up the deadline on your latest project. A friend has called and asked you to be on another fundraising committee that you know you don’t have time for, but you said yes to anyway. Meanwhile you’re trying to figure out how you will get dinner on the table for your family and still help your child with his homework. This is more stress, and it triggers more adrenaline to be released, and those physiologic changes shift into overdrive and the cycle repeats day after day and week after week. This is adrenal stress. Adrenal stress causes constant fatigue, insomnia, food cravings, mood swings, constipation, high blood pressure, hypoglycemia (alternating very high peaks and very low valleys in blood sugar) and/or weight gain. This will continue until you break the stress cycle OR your adrenal glands become so fatigued that they stop functioning. Your body uses up large amounts of vitamins and minerals to keep the adrenals working at this high level. And, let’s face it, you haven’t been eating so well lately with all those food cravings. Your body only has a limited supply of nutrient based fuel and when it runs out, your adrenals poop out resulting in Adrenal Fatigue. 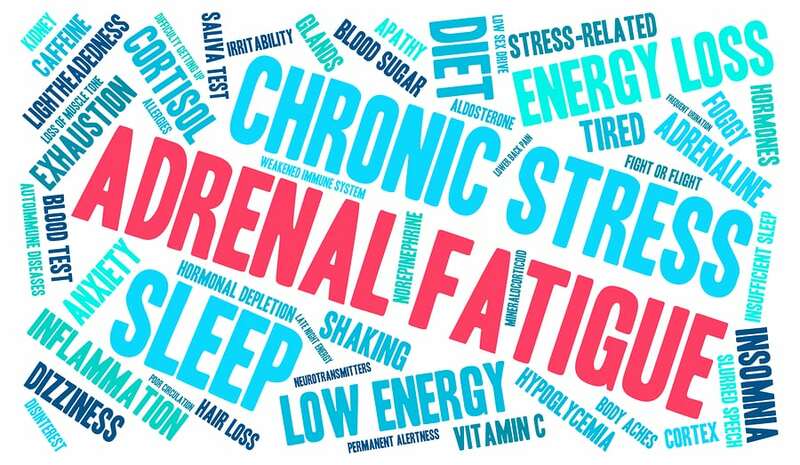 As the name suggests, Adrenal Fatigue’s paramount symptom is fatigue that is not relieved by sleep. 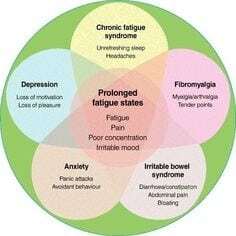 You may look and act relatively normal with adrenal fatigue and may not have any obvious signs of physical illness, yet you live with a general sense of unwellness, tiredness or “gray” feelings or even depression. People experiencing adrenal fatigue often have to use coffee, colas and other stimulants to get going in the morning and to prop themselves up during the day. This syndrome has been known by many other names throughout the past century, such as non-Addison’s hypoadrenia, sub-clinical hypoadrenia, neurasthenia, adrenal neurasthenia, adrenal apathy, adrenal fatigue or plain old exhaustion. Although it affects millions of people in the U.S. and around the world, conventional medicine does not yet recognize it as a distinct syndrome. Emotional Stressors can include: the death of a loved one, a divorce, a change in job or career, having a baby, taking care of an ill family member, graduating from school, a move to a different town, or any type of severe repeated or constant stress in your life from work or family life. Physical Stressors include crisis such as an accident, a major surgery, a prolonged illness or too little or too much exercise. Physiologic or Chemical Stressors include use of medications, drugs or alcohol, or even poor eating and dietary habits. Your adrenals have to respond to all these types of stress and attempt to maintain homeostasis at the same time. If the adrenals run out of fuel to operate optimally, you are likely to experience some degree of adrenal fatigue. In general, the longer you are in adrenal stress or adrenal fatigue mode, the more depleted you are, and therefore, the more severe your symptoms will be. How can you tell if your adrenals are stressed or fatigued? You have difficulty bouncing back from stress or illness or get colds or respiratory illnesses frequently. You crave salty and/or sweet snacks or high fat foods like fried foods. You feel more awake, alert and more energetic later in the evening than you do all day. You’ve experienced weight gain, especially around your middle, despite no change in eating habits or exercise routines. You have mood swings or feel blue or cry for no apparent reason. You have begun experiencing headaches, muscle tightness and pain. You are having muscle cramps or twitches. Your body is sore and fatigued after exercise or you are experiencing poor muscle recovery, without a change or increase in your exercise routine. You are experiencing rapid heart rate or you are aware of your heart beating. You feel breathless from time to time. You are having anxiety or panic attacks. There has been a change in bowel movements such as constipation or diarrhea. You are experiencing hypothyroid symptoms or you’ve needed your thyroid hormone increased. You’ve had changes in your menstrual cycles or are experiencing PMS or menopausal symptoms which have changed with the onset of fatigue. You can’t get to sleep, or perhaps stay asleep OR you dream a LOT, and wake between dream cycles. You’ve turned to caffeine to keep you going. The first thing I tell my patients to do is to start saying ‘no’ to non-essential activities and slow down and make time for themselves. That’s something you can do for yourself and you don’t need a prescription. Second, I like to test my patients’ hormone levels to find out what phase of adrenal stress or fatigue they are experiencing. These test results let me know if the problem can be managed with diet, lifestyle and stress management only or if herbal or nutrient specific supplements are needed to correct adrenal function. Lastly, stay the course and give it time. You did not end up where you are overnight and it’s going to take about 6 months to correct the situation. Your adrenal glands influence so many other hormones and body systems that it takes time for all of them to recover. If you live in the Fort Myers area and would like to find out if you need help supporting your adrenal system, call (239) 243-8735 to schedule your consultation. ⟵Cravings – what’s the body trying to say?